I did this lot for the “How well do you know me?” challenge at TSS. This month’s judge was Kimwriter75, which was the cause of the name! Take a look at the slideshow here, and find the lot on the exchange here! 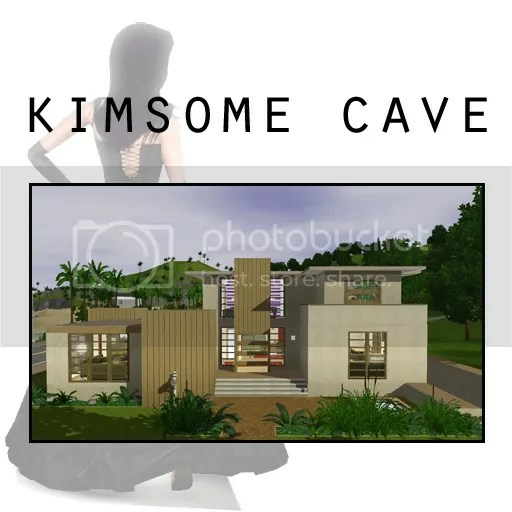 Instead of giving you the normal write up, I’ll just post the rationale from the challenge – WARNING: this contains spoilers, so don’t look further if you are going to build a house for Kim! I have finished your home. As you probably will see when looking at the enclosed photos, I have tried my best to cater your needs and wants. First, I built a modern style home, since that’s what you normally do and like. I have also chosen colours similar to those seen in your builds. I also wanted to use your favourite colour purple in your bedroom. You will be happy to see that I found a place for Chaos and Jerry in the living room. After all, kittehs are family too! Since you’re a micro cook, I wasn’t sure if I should include a full kitchen, but decided to do so, since another sim might move in at some point! You should be happy to know that I included both your dear microwave, and also a coffee maker to make sure you stay caffeinated at all times. I also gave you a big home bar to make sure you will keep hydrated to make Friday nights interesting for us all! The laundry room is really a small, claustrophobic room, so don’t spend more time in there than you have to. It’s better to go outside and relax in the hot tub. Since you seem to enjoy photography these days, I made you a small portrait studio in the basement. Don’t worry too much about that horrible car you can see in the pics, it is mine, and now gone from your home. I have also noticed you have a thing for hopscotches, so I wanted to give you your very own. Please feel free to mock me now. I have been running around Sunset Valley taking pictures to decorate your home with, and I tell you, some of them turned out really nice! Don’t worry too much about the gorgeous lady in the pics getting noticed as garden objects by the software, we all see the difference between a gown and a gnome. I hope you will be happy with your new place!